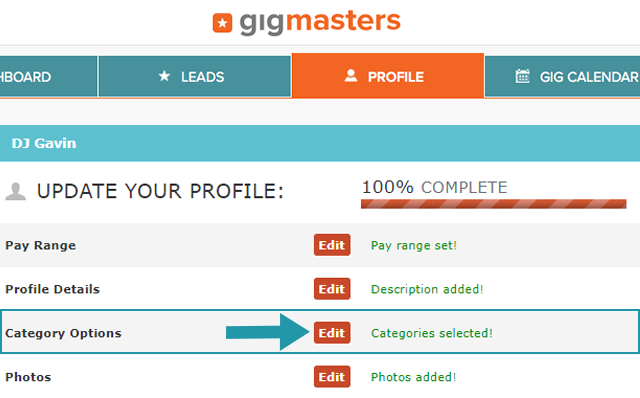 One of the first things you will do when you set up a GigMasters membership is select your categories. This can be one of the keys to your success on GigMasters. Your category selection determines how clients will find you on our site and will directly affect the quality of the leads you receive. Go to the 'Profile' tab. Click the 'Edit' button for 'Category Options'. Click the 'Update Categories' button at the bottom of the page to save your changes. Once you select your Membership Type (first drop-down box on the 'Modify Categories' page) you then select your Primary Category (second drop-down box). Your Primary Category is the number one way that clients will find you on GigMasters. Selecting a popular category is recommended as your primary, however, top-level terms are not suitable for everyone. If you offer a unique act or provide a specific service, you'll want to choose those categories. Next, it's time to select your secondary categories - this is where you can get specific. Depending on your membership, you'll get to choose 6-12 secondary categories for your business. First off, it is important to know what not to do. You should not select categories that do not apply to you. If you select inappropriate categories, many of the leads that you receive will not be right for you and you will miss out on those leads that would actually be a good fit. Selecting the most relevant categories will allow you to receive the most appropriate, quality leads. You can edit your categories at anytime! So, for example, if you're in a competitive location, you may want to experiment with choosing a more specific category. Not sure which categories to choose? Give our Account Services team a call at 866-342-9794 and they can help you determine the best categories for your business.